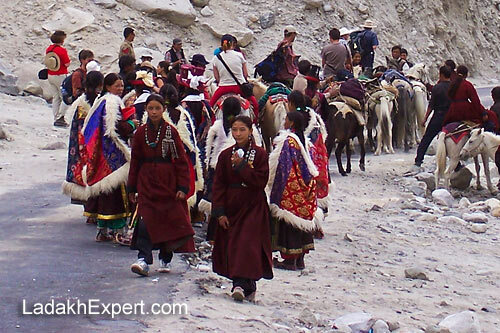 Ladakh Festival is organized each year by the Jammu and Kashmir Tourism Department, in a bid to promote and represent Ladakh’s rich cultural heritage and will be held from 1st to 15th of September 2013. During the 15 day long Ladakh Festival, various events like Polo Match, Village Archery, and Folk Dances are held along with monastic dances in the monasteries across Ladakh. This gives an opportunity to travelers from India and Abroad to not only view the beautiful landscape of Ladakh in what is normally considered as lean season, but also see and experience the beautiful and rich cultural heritage of Ladakhis. And it isn’t just limited to areas in and around Leh, but across the Ladakh Tourist circuit like this small gathering of locals and tourists in Panamik Village in Nubra Valley, which I captured during one of my trips to Ladakh. Add to that, places like Suru and Zanskar Valleys are at their beautiful best during the month of September, making it all the more enticing to visit Ladakh in this traditionally lean tourist month of September. Manali – Leh Highway to reopen in June! Permit for crossing Rohtang, now available online! Copyright © 2019 Ladakh Expert. All Rights Reserved.